Andrea Rosen Gallery is delighted to announce David Altmejd's second solo exhibition at the gallery and his first one-person show in New York since 2004. One of the pleasures of following Altmejd's career is being witness to an artist with an insatiable passion for the opportunity to grow his practice in scope and complexity. 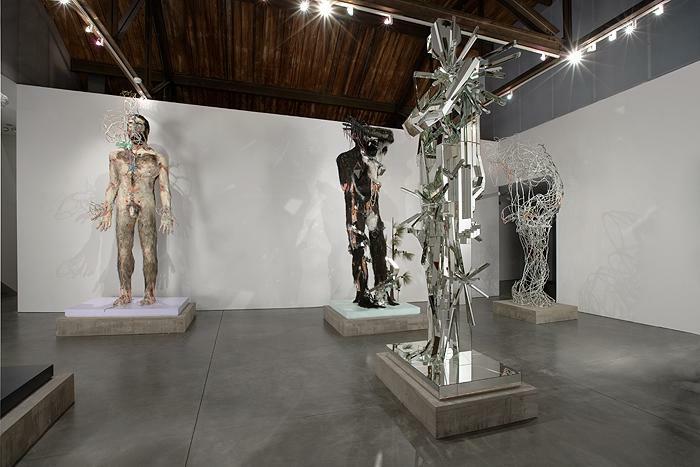 In 2007 alone, Altmejd was not only selected as one of the youngest artists to represent a country at the Venice Biennale, but also produced a stunning body of work that many considered one of the most impressive of the national pavilions. Speaking to his ability to conjure new and more incredible works, Altmejd helped inaugurate the newly designed Museum of Contemporary Art, Denver with a mirrored installation of six colossal giants only six months after turning the notoriously challenging space of the Canadian pavilion into a jewel-like aviary. Altmejd's diverse and varied oeuvre includes his familiar platform-like structures punctuated by mirrored reliquaries of crystals, flowers, birds, and werewolf bodies and body parts, an inventive assortment of singular werewolf heads, clear Plexiglas boxes filled with an intricate tracery of gold chains, his spectacular aviary filling the Canadian Pavilion at the 2007 Venice Biennale, uncanny part-bird part-human sculptures, a sculptural clock representing the temporal process of its making, and most recently colossal giants. This array of characters and forms speaks not only to Altmejd's inventiveness but also to the strength of his aesthetic and conceptual program. Instead of an incongruent assortment of ideas and objects, Altmejd's body of work is always recognizably his own, simultaneously expansive and coherent. 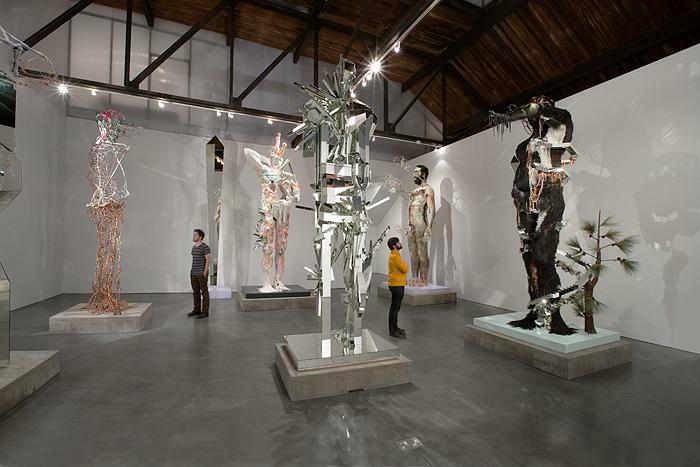 For this exhibition Altmejd will present a body of new giants. The works being created for this exhibition are unique in their use of every part of Altmejd's pre-existing vocabulary to create a group that expands the language of the giants, with each being completely different from another. The giants, while evoking the history of monumental sculpture, also incorporate the more recent discourse of Minimalism and the Part Object. Altmejd melds and weaves the disparate yet connected institutional critique of Minimalism and its radical eradication of visual incident with the luscious surfaces and psychological eruptions of the work of artists associated with the Part Object, which, to quote art historian and critic Helen Molesworth, are works that seem "skeptical of language's ability to contain our bodily experiences" and offer "a series of imperfect vessels, cast objects filled with the matter of their own making, surfaces resistant to words." Altmejd is known for creating works which set up a duality between a geometric architectural space and more figurative material, manifest in his well known platform-like sculptures housing a glittering cabinet of curiosities. In the giants, the figure also becomes the structure, melding the two formal facets of hard-edged and amorphic. The body itself is pictured as a contingent form, a psychic container, and a field of unending transformation and renewal governed by social and environmental forces. 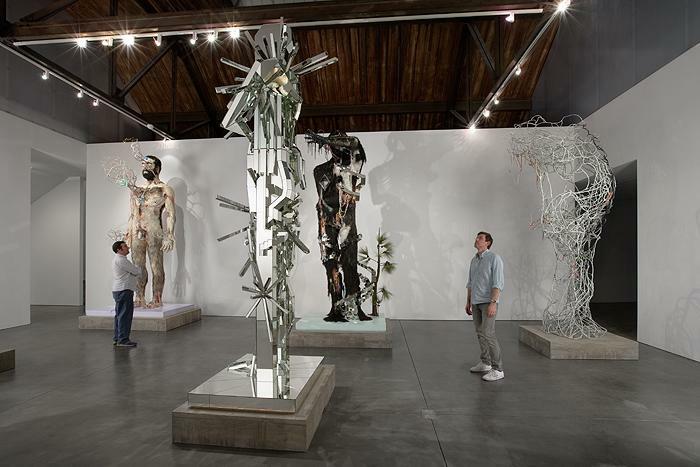 Like a biological organism, Altmejd's sculptures are always in a state of becoming. Mirrored, spiraling staircases are a visual metaphor of infinity and the seemingly growing clusters of crystals and mirrored cubes, hair, and stalactite epoxy clay all work to picture a sculpture in a constant state of change. In the viewer's imagination, Altmejd's work operates not as a presentation, but rather, as a material with which to construct and reconstruct meaning over and over again. In a world where we have become used to having to decode the artist's intentions, Altmejd presents work so filled with content and embedded with meaning that it allows the viewer to bypass the need for a simple intellectual explanation and allows him or her to instead become a visceral participant in the construction of worlds that much like our own are forever a mystery, infinite in their ability to change, generous in meaning-a world of glittering growth and sublime decay, of heart rending pain and ravishing desire. David Altmejd received his BFA in visual art from Université du Québec à Montréal in 1998 and his MFA from Columbia University in 2001. 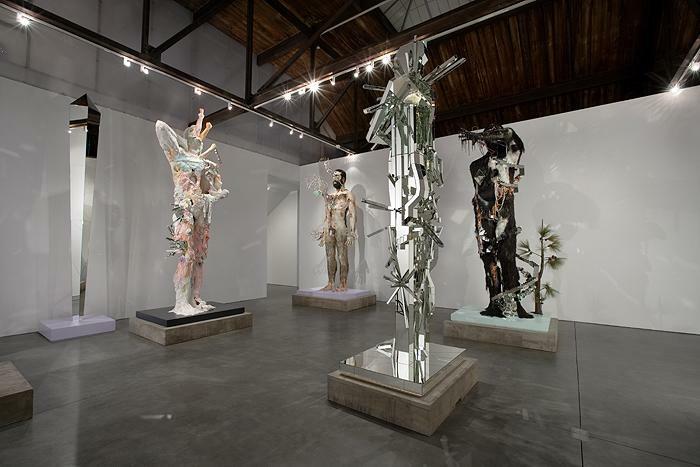 Altmejd's work has been included in the 2003 Istanbul Biennial, the 2004 Whitney Biennial, and in 2007 Altmejd represented Canada at the Venice Biennale. For 2008 he has been selected to participate in La Triennale québécoise at Musée d'Art Contemporain de Montréal and the Liverpool Biennial at Tate Liverpool. 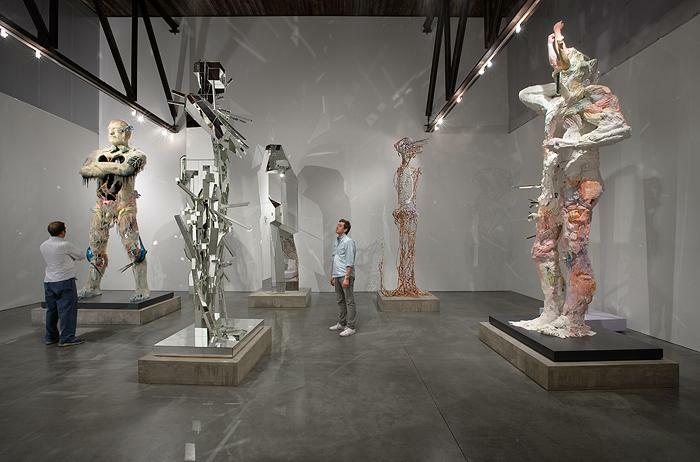 Altmejd's works can be found in the collections of the Whitney Museum, New York, the Guggenheim Museum, New York, and the Art Gallery of Ontario, Toronto. David Altmejd is known for his intricate and highly worked room-size installations and sculptures. Seamlessly moving between a variety of aesthetic modes – from an almost ascetic minimalism in works employing plaster and mirror to works teeming with accumulations of crystals, gold chain, thread, taxidermied birds and animals, among other objects -- Altmejd’s work offers beautifully wrought meditations on the cycles of life and death, interiority and exteriority, sexuality, and spirituality. In the most comprehensive consideration of the artist’s work to date, the volume includes four essays by a range of writers, who by providing different entry points to Altmejd’s art, animate and engage the rich and diverse ideas that characterize his important practice. The full range of Altmejd’s nearly 20 years of work is featured in the book, from his earliest work--where the vast aesthetic vocabulary he has evolved over the years took shape--to his most recent series. Organized roughly chronologically, with an extensive art historical essay by Robert Hobbs as well as pithy contributions from the other esteemed writers forming the connective tissue between expansive sections of color plates, one can trace the many through-lines that the artist has developed and reworked during his career. The book affords a close and intimate view of the inspired and wholly unique work that brought him to prominence in the early 2000s, while also providing a sense of the breadth and scope of his polymath-like creativity and inventiveness in work less well-known or chronicled. Trinie Dalton is a writer of fiction and short stories, as well as being an accomplished art writer. Wide Eyed (Akashic), Sweet Tomb (Madras Press), and A Unicorn Is Born (Abrams) are works of fiction. Dear New Girl or Whatever Your Name Is (McSweeney’s) and Mythtym (Picturebox) are compilations of art writing. She has written articles for venues such as Bookforum, Paper, Purple, Arthur, The Believer, and Bomb. She teaches book/arts and writing at Pratt and NYU, and is on the MFA Fiction faculty at Vermont College of Fine Arts. Christopher Glazek is a writer living in Los Angeles and the founder of the Yale AIDS Memorial Project. His essays focus on a range of social and cultural issues. Recent work has attended to complex problems such as the incarceration crisis, HIV/AIDS, credentialism, and student debt, in addition to critical writing devoted to art, film, literature, and music. His work has appeared in Artforum, the literary journal N+1, New York Magazine, The London Review of Books, and NewYorker.com, among other publications. Robert Hobbs is an art historian at Virginia Commonwealth University, where he has held Rhoda Thalhimer Endowed Chair since 1991. He has also been a visiting professor at Yale University since 2004. Recognized as a scholar, teacher, and curator, Hobbs specializes in both late modern and post-modern art. He has published widely and has curated dozens of exhibitions at important institutions in the U.S. and abroad. His publications include monographs on Milton Avery, Alice Aycock, Edward Hopper, Lee Krasner, Mark Lombardi, Robert Smithson, and Kara Walker, and he has also written on Hernan Bas, Keith Haring, Jonathan Lasker, Mark Lindquist, Malcolm Morley, Neo Rauch, Andres Serrano, Yinka Shonibare, James Siena, Meredyth Sparks, and John Wesley. Published by Xavier Hufkens, Brussels, on the occassion of David Altmejd's 2013 exhibtion at the gallery. This publication accompanies the exhibition David Altmejd: The Index, organized by the Galerie de l’UQAM and presented in the Canadian Pavilion at the 2007 Venice Biennale. The catalogue includes an essay by Louise Déry about The Index, and The Giant 2. Its title refers to the principle of collection and of the diversity of species, to their classification, their organization into a dynamic avifauna, where an internal equilibrium ensures the perpetuity of the system, which somehow suggests a symbolic architectural modelling of life. This publication won an award in the 2008 Grafika competition. This publication is the first monograph dedicated to David Altmejd. It provides extensive visual documentation, particularly on the work The University 2, exhibited at Andrea Rosen Gallery in 2004 and acquired by the Guggenheim Museum in New York. The essay by Louise Déry surveys ten years of work and examines the major aspects of the artist’s research and of his oeuvre. This book was published to coincide with the travelling exhibition David Altmejd, organized by the Galerie de l’UQAM in 2007 and presented in Montreal (Galerie de l’UQAM), Oakville (Oakville Galleries) and Calgary (Illingworth Kerr Gallery, Alberta College of Art + Design).